With so many tile options available, make sure you are picking the BEST products for your client. Choosing the right tile can be tricky, but the perfect choice is integral to your client's happiness. The best tile for a room depends on several different factors, including the room's usage and the home's aesthetic. Download this free eBook and learn more about the various features and applications of Stone, Ceramic, and Porcelain tile. 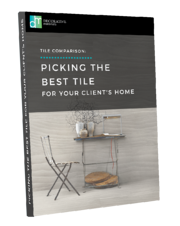 Complete the form to right to receive your free tile comparison guide and navigate finding the perfect tile for your client’s home every time.